A little over 4 miles out and back. Good things are found at the south end of the bustling alley between Railroad Avenue and North State Street. You've got the community bike shop, The Hub. You've got Wailing Goat Espresso. You've got summer smells of barbecue, the famous back porch of The Green Frog bar, and Honeymoon Mead and Cider's quaint (but not quiet) bar and alley seating. But most importantly, you've got the South Bay Trail. Just over 2 miles at full length one-way, this trail is a waterside connection of downtown Bellingham and its south sister, the Fairhaven District. While the exact crosshairs of the beginning of South Bay Trail are trivial and depend on how far back in the alley you want to begin your run/ride, here's what you need to know: The best spot to pick up the trail is 20 yards west of the intersection of East Laurel St and North State Street. Standing in this alley, you look north toward downtown Bellingham (and the Honeymoon and Green Frog bars), and south to the trail. Its beginnings are loose gravel, but it quickly switches over to a hard-pack gravel trail. It's about five or six people wide at times: so while large enough for two way traffic, afternoons can get busy and it's best to remember those trail manners. 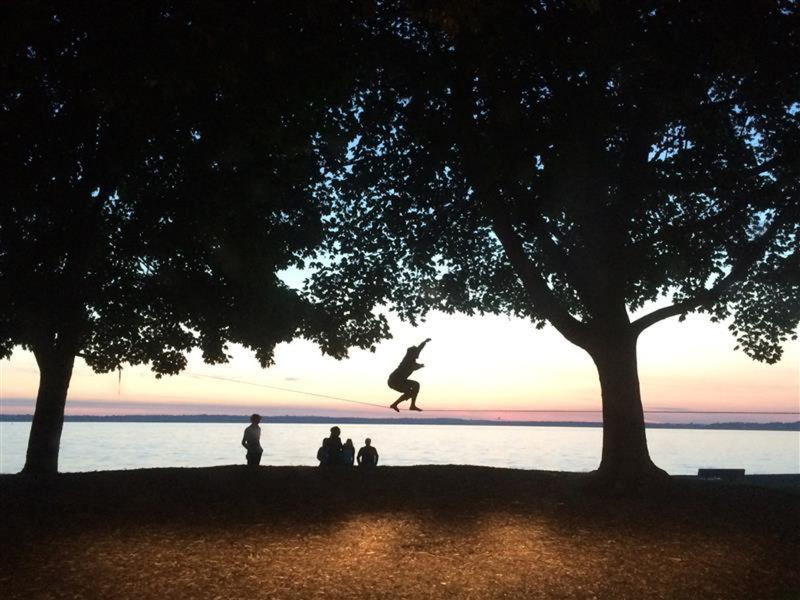 About 1.5 miles south, you'll find Boulevard Park. Here, the trail switches over to a skinnier cement pathway, and winds its way along the outskirts of the grass, close to the water. You'll need to probably slow down a bit here with all the people. After passing by the park and coffee shop, the trail gets sweet. As it widens, it goes boardwalk-style, extended over the coastline of the bay. This continues for another half mile, probably a good 100 yards off of the shoreline. At its end, it takes a sharp turn inland, and up a short, gentle grade. There is a small dock, a handful of benches, and plenty of people when the sun is out. The South Bay Trail continues south down 10th street towards Fairhaven, through a clearing on a gravel trail and terminating at the downtown Fairhaven Village Green. 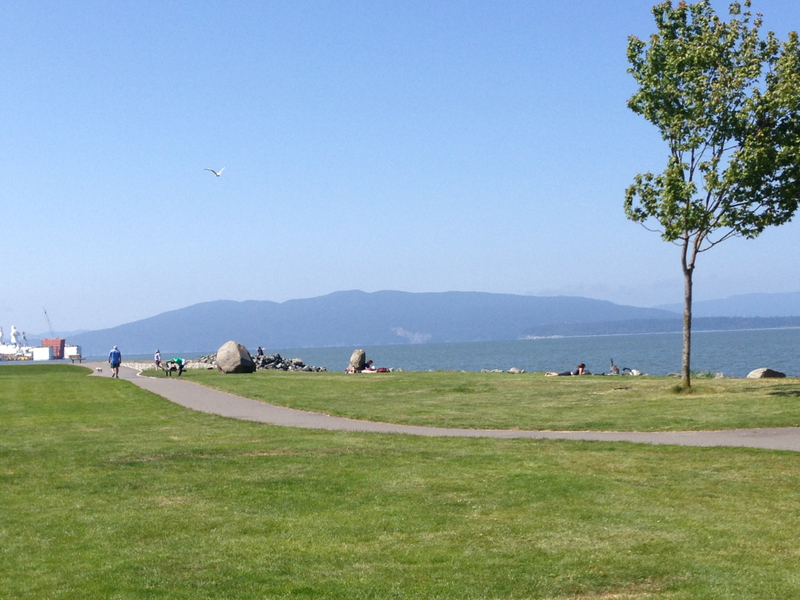 A newly renovated small beach, field and playground, picnic benches, barbecues, and The Woods coffee shop make this park one of the best places to be when the sun is out in Bellingham. A moderately sized (but often busy) parking lot can be accessed via Bayview Drive off of South State Street. The park is the separation between the gravel, north side of the South Bay Trail and the boardwalk south side of the trail. The field is big enough to kick a soccer ball, play frisbee, and set up a slack line between the trees. The Woods coffee shop has wifi and indoor and outdoor seating. The sunset views are pristine. Looking to cool off in the summer? Walk down the boardwalk portion, and you'll surely see people jumping off the bay side of the boardwalk, next to the dock. Hint: Runners, a quick dip mid-run can do wonders to bring life and energy back to your legs. This trail is perfect for those looking for an easy, scenic, evening or morning run or walk. The length is short, and the grade is flat. This is the perfect length for a recovery run - pushing the pace might be difficult with the crowds. But possibly the best thing about this trail is its connection to the Interurban Trail, beginning a few blocks south of the Fairhaven Trail. Those looking to get to the popular Interurban trail from downtown Bellingham can start at the beginning of the South Bay Trail, or park at Boulevard Park and start there. This is also ideal for a family cruise on the bikes between Fairhaven and Bellingham, as both ends deposit you into the respective downtowns, while the middle of the trail has Boulevard Park. Parking at the north end is tough: you're in downtown Bellingham, so if it's after 6pm, park wherever you see fit. But if it's not quite 6pm, you'll probably need to watch the meter, so parking can be found on Cornwall Avenue. Please don't park in the alley. There is also parking at Boulevard Park. At the south end, there is a free, but limited parking where the boardwalk comes back to land. A good spot to park is near the Fairhaven Village Green. A large, free, gravel lot is at the intersection of Mill Ave and 11th Street. Along the trail, there are stairs leading up from the trail to Boulevard / State Street. These access points have no parking. They are roughly found where Boulevard / State Street intersects Pine Street, the South State Street split, and just north of 14th street.